Wynonna Earp comic creator Beau Smith couldn't stop smiling at San Diego Comic-Con as he talked about the success of his first female-driven comic turned television series. He quite simply called it "amazing." He said he "never in a million years" thought it would be as successful as it has been. He also credited showrunner Emily Andras for making the television series exactly how he always envisioned it – with "likability and humor." Smith said the transition to a television series happened rather quickly, over a matter of a few weeks, once Syfy picked it up. He was immersed in scripts and audition tapes including Melanie Scrofano's who plays the main character. He found her to be "surreal" and a "dream come true." So do we, Beau, so do we! Click the video to see what else Beau Smith had to say about his titular character and the series in general. 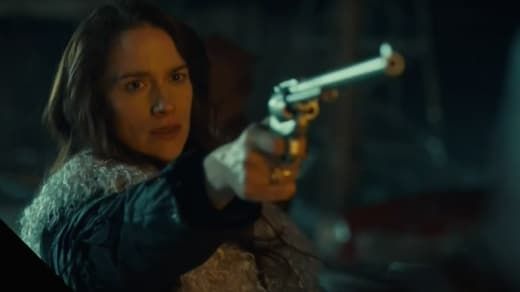 If you haven't yet seen the show or need to catch up, you can watch Wynonna Earp online right here via TV Fanatic!